New Panthers safety Eric Reid is still suing the league, which he says colluded to keep him out during off-season free agency. 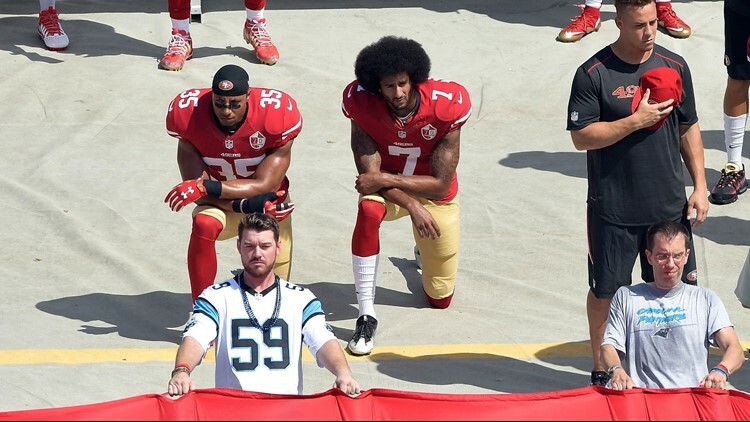 CHARLOTTE, N.C. -- New Panthers safety Eric Reid kneeled during the national anthem Sunday before his first game with Carolina against the New York Giants. Reid, who was signed by the Panthers last week, made headlines in his first press conference by wearing a shirt with the hashtag #ImWithKap on the front. Carolina signed Reid during the team's bye week after placing safety Da'Norris Searcy on the injured reserve. Reid signing came with controversy as the new Panther is still suing the NFL, saying the league colluded to keep him out during offseason free agency. Colin Kaepernick #7 and Eric Reid #35 of the San Francisco 49ers kneel during the national anthem before their game against the Carolina Panthers at Bank of America Stadium on September 18, 2016. Photo by Grant Halverson/Getty Images. When Reid spoke with the media earlier in the week, the one-time Pro Bowl safety made one thing clear: his re-entry into the NFL will not come quietly. "Like I said, I will keep speaking for my people," he said. As for his new Panthers teammates, they're more concerned with what he'll do after the national anthem. "He's going to be impact player for us and that's all I care about," said quarterback Cam Newton. "All that other stuff y'all can write." Wide receiver Torrey Smith said he doesn't care what Reid does during the national anthem. "He does whatever he feels in his heart," Smith said. "Eric is going to be ready to play ball this weekend and he's going to help the Carolina Panthers win."